Biography for Peter A. Tyrrell - One of the eleven founders of the National Basketball Association - First President of Ice Capades, etc. TYRRELL, Peter Aloysius, entertainment entrepreneur, was born in Philadelphia, Pa., Apr. 8, 1896, son of Peter Redmond and Agnes Anastasia (Bowen) Tyrrell. His father came to this country from England in 1890 and settled in Philadelphia, where he was a barber, wigmaker, and cigarmaker. 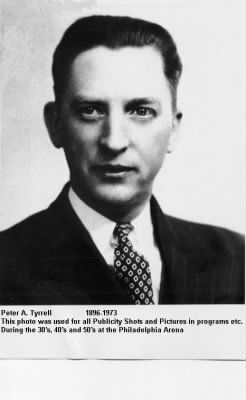 Peter A. Tyrrell received his early education at St. John the Baptist High School for Boys, Manayunk, a suburb of Philadelphia, and completed a two year business course there. He began his career in 1912 as a stenographer and clerk in the employ of the Girard Trust Co. ( later Girard Bank), Philadelphia, continuing in that capacity until 1914. From 1915 to 1917 he was a clerk in Philadelphia for the Baltimore & Ohio Railroad Co., and during 1917-19 he was engaged in typewriter demonstration and maintenance work for the Hooven Automatic Typewriter Co., Philadelphia. Later in 1919, having spent some months as a sportswriter with the Manayunk Review, a newspaper, published in Manayunk, he entered the field of sports promotion and publicity, establishing a 3,000-seat facility on a carnival lot in West Manayunk, across the river from Philadelphia, where he staged fifteen-round boxing matches, the limit in Philadelphia proper then being six rounds. In 1920 he went to New York City as publicist for Al Lippe, a boxing manager, and the following year he returned to Philadelphia to serve in a similar capacity for Boo Boo Hoff (Max Hoff), a boxing promoter and manager, with whom he continued his association until 1929. In that year Tyrrell became a boxing matchmaker with the Philadelphia Arena, then that city’s largest public entertainment facility. With the decline in boxing attendance during the national economic depression of the 1930s, Tyrrell subsequently became publicist for the Arena, and when it went bankrupt in 1934 he was appointed a friendly receiver in equity by George Welsh, a federal court judge. In that capacity he served as general manager of the Arena until 1958, returning its operations to profitability. In 1958 he and associates purchased the Arena and established the Philadelphia Arena Corp., with Tyrrell as president and general manager. He retained those posts until his resignation in 1965. The Philadelphia Arena was built in 1920 by George F. Pawling, an engineer and athletic official, who installed $150,000 worth of icemaking equipment in an unsuccessful effort to increase the popularity of ice skating in Philadelphia. In 1925 the building was acquired by Jules Mastbaum, owner of a chain of motion picture theaters, who renamed it the Arena and operated it primarily to stage boxing matches. Two years later the Arena was sold to Rudy Fried and Maurice Fishman, boxing promoters, who operated the facility until it was placed in receivership in 1934. In 1947 the Arena was purchased by Triangle Publications, Inc., Philadelphia , later becoming part of the Annenberg Foundation, which sold it to Tyrrell and associates in 1958. Upon Tyrrell’s resignation as president and general manager in 1965, the Arena was sold at auction to James Toppi Enterprises, a sports promotion concern. During his years with the Arena, Tyrrell significantly enriched the variety of public entertainment in Philadelphia and elsewhere. In 1936 he became one of the first to book the Shipstad and Johnson ice-skating show, and its success in Philadelphia led to the establishment of the Ice Follies, which in turn became one of the most successful shows in the entertainment field. In 1940 he formed an association with ten eastern sports Arenas which financed the Ice Capades, another ice-skating show, separate from Ice Follies. Tyrrell was named business manager and organized and signed the talent for the first production. He served as first company manager and president in 1940. After rehearsing the show in the Philadelphia Arena, Tyrrell took it on its first road trip to New Orleans, La. Subsequently, the show was taken to Atlantic City, N.J., and rehearsed during the summers under Tyrrell’s direction before setting out on road tours throughout the country during the winters. He was a director of the Ice Capades from 1940 until 1963, when the company was sold to Metromedia, Inc., for $5 million. He convinced Sonja Henie, a figure skater, to turn professional, and she made her professional debut at the Arena and subsequently became the star of her own show, Hollywood Ice Revue. Tyrrell also brought to Philadelphia its first major rodeo, starring Gene Autry. When Autry left the show, Tyrrell hired Roy Rogers, who was playing in cowboy and western movies at the same studio as Autry. Playing his first arena rodeo, Rodgers was well received and Tyrrell arranged his appearances at other arenas. During the 1940s Tyrrell arranged at the Arena what were considered the worlds first televised ice show, basketball and hockey games, and boxing match. In 1949 he arranged in five weeks the welterweight boxing championship match between Sugar Ray Robinson and Kid Gavilan, selling $90,000 worth of tickets at the gate. The match was held at Municipal Stadium (later John F. Kennedy Stadium) in Philadelphia, and drew a total of $178,000 and attracted an audience of 27,805, the second largest for a boxing match in Philadelphia history. Tyrrell was known for his varied programming. The events held at the Arena during his tenure including the Johnny Weismuller and Buster Crabbe swimming shows, roller derbies, billiards contests, six-day bicycle races, dance marathons, rocking chair derbies, furniture sales, automobile shows, an endurance race between men and horses, and performances by the Spanish Riding School, the Lippizaner Stallions of Vienna, the Moscow Circus, the Scotch Guard, Gracie Fields, Bob Hope, Nat King Cole, Victor Borge, Elvis Presley, and Marion Anderson. Among the more unique events was the wedding of a couple participating in a dance marathon in Camden, N.J. Brought to the Arena in an open truck with orchestra, the couple danced in to, and during the ceremony and back to Camden in the truck. Red Skelton served as master of ceremonies for the marathon and the wedding. On another occasion the funeral of a cowgirl who died while performing with the Roy Rogers rodeo was held at the Arena, with Rogers and the Sons of the Pioneers singing “Round-up in the Sky,” after which the entire rodeo troupe rode with the casket to the cemetery. Upon retiring from the Arena in 1965, Tyrrell established Pete Tyrrell & Associates, Philadelphia, to engage in the promotion of individual attractions at the Arena and other stadiums in the Philadelphia area. Tyrrell served as president of this firm from its inception until the close of his life. In addition to his main activities, he was a founder Basketball Association of America (BAA), forerunner of the National Basketball Association (NBA), and for a time he managed the Philadelphia Warriors professional basketball team, which won the 1946-1947 BBA championship. He also brought the Ramblers team of the American Hockey League to Philadelphia as a farm club of the New York Rangers. Interested in civic affairs, Tyrrell and Oscar Johnson, owner of Ice Follies, staged a benefit in 1954 for the orphans of ten fireman killed in an explosion during a fire at a chemical plant in Philadelphia that year. This benefit became a forerunner of the annual Hero Scholarship Fund and Thrill Show which was organized in that year with Tyrrell serving as a director until the close of his life. At other times he staged benefits for prison welfare and for various church-operated welfare homes and hospitals. He brought about the repeal of the section of the Pennsylvania Blue Laws prohibiting entertainment events on Sundays by staging a benefit show for St. Joseph’s Home, a church-operated institution, on a Sunday. The benefit became an annual event. Tyrrell was the recipient of a large number of awards from local groups for his charitable and fund-raising activities. From 1963 to 1965 he was vice-president of the National Arena Managers Association. His religious affiliation was with the Roman Catholic Church. In politics he was an independent. For recreation he played golf, winning numerous trophies, and he was a member of the Bala Golf Club of Philadelphia. He was considered an exceptional pocket billiard player and played exhibition matches with many world champions. He was married in Philadelphia, Jan. 24, 1927, to Elsie Amelia , daughter of Julius Fred and Amelia Elsie (Dreger) Day of that city, and had three children:Peter Aloysius, who married Mary Patricia Kelly; Elsie Amelia, who marriedJohn Edward Rann; and Eleanor Agnes. Peter A. Tyrrell died in Philadelphia, Pa., May 8, 1973.